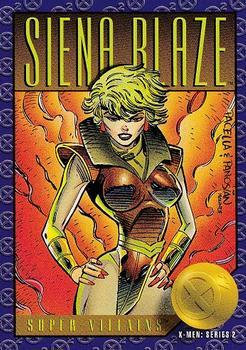 100 cards (including one checklist card), with four hologram chase cards featuring original art, and nine 30th anniversary gold foil chase cards. 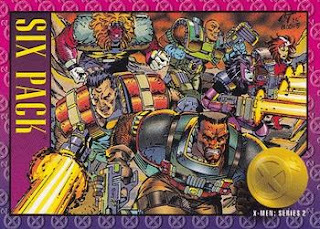 While the first series of X-Men-specific trading cards served as a showcase for the work of superstar artist Jim Lee, Lee had, of course, left Marvel in fairly notable fashion, and wasn't about to contribute to a second series of cards. 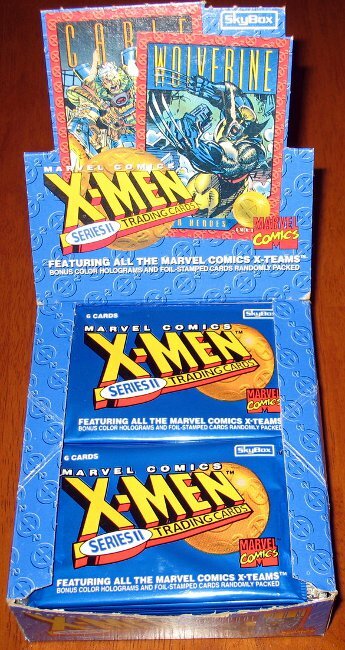 But Marvel, at the height of not only the comic book speculator boom but really an overall boom market in collectible hobbies, wasn't about to not release a second series of X-Men cards. And so we have X-Men Series II. 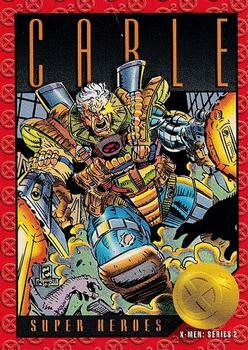 In lieu of Jim Lee, this series features artwork from all the then-current X-book artists, including Alan Davis, Brandon Petersen, Andy Kubert, Joe Quesada and Greg Capullo, with each artist (more or less) drawing the cards of the characters from his respective series, with series fill-in artists Art Thibert, Liefeld clones Marck Pacella & Dan Panosian, and Joe Madureira also pitching in artwork, particularly in the Super-Villains category. 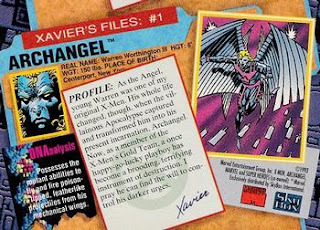 Unlike previous sets, which ordered their cards seemingly at random, these cards are numbered alphabetically (within each category), so that Archangel is the first card of the series, Beast the second, etc. The cardbacks list the character's real name, height, weight, and place of birth, alongside and inset headshot of the character. There is alsoa short biographical profile and a "DNA analysis" detailing the character's power(s), as well as a smaller, secondary image of the character. Unlike previous sets, the cardbacks are all presented landscape, meaning every card has to be turned to read the back. Also, any first appearance notations are missing (something that always bugged me as a kid; coming up in the age of Wizard, I was a little obsessed with first appearance issues). The biographical information on the back of the cards is listed as being from Xavier's Files (with the card's number tied to the file, ie card #1 is "Xavier Files #1"), with the profile information written from Xavier's perspective (not unlike how the Stryfe's Strike Files entries were written from Stryfe's perspective). 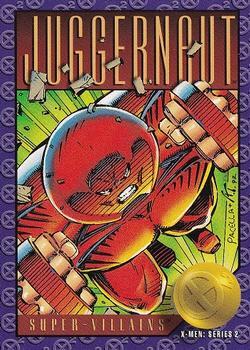 Each card front features a solid color border over repeating X logos, with the character's name listed on a solid-color background on the top of the card, and the category listed on the bottom, next to a spherical X logo and and a "X-Men: Series II" notation. The cards in the Arch-Enemies category feature one image spread across multiple cards, with every two cards creating a shared image, and every third card creating one image with the cards above/below it (basically, when the cards are laid out in the nine-panel grid of a card binder page, the first two cards in each row form one image, while the three end cards in each row form one vertical image). 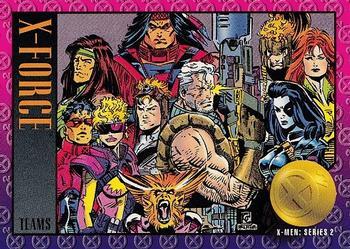 The last nine cards of the series (before the #100 checklist card) feature images from the X-Men Animated series, with the cardbacks loosely describing the plot of the first episode while detailing the powers/personalities of characters featured on the card front. 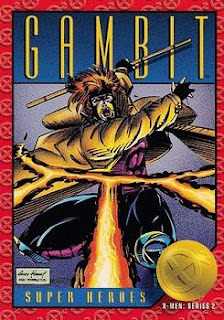 Xavier notes on Gambit's card that he doesn't usually allow felons to join the X-Men, though Gambit is hardly the first (see also: Storm and Rogue. And probably Wolverine). Having not been members of X-Force when the first series was released, this set features the first trading cards for former New Mutants Sunspot and Rictor. 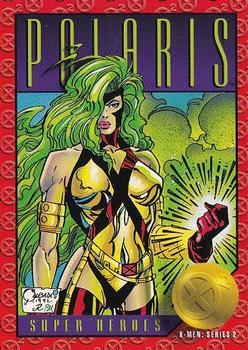 Most of the X-Force cards feature the characters' new looks from X-Force #19, while Polaris' card features her new costume, from X-Factor #87. 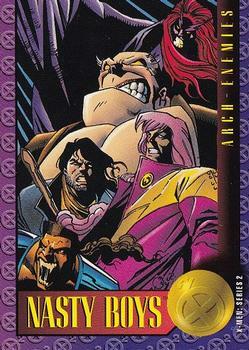 The Acolytes receive their own card as part of the Arch-Enemies category (forming a triptych image with the X-Men and Magneto), featuring members introduced in Uncanny X-Men #298-300). 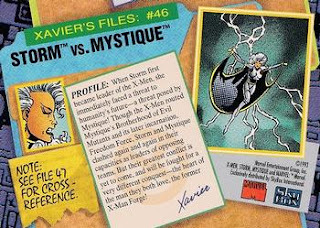 Storm and Mystique are paired up as arch-enemies, which I guess is based entirely on their interactions in Uncanny #289-#290 and some notion that Mystique "stole" Forge from Storm? The Nasty Boys, from X-Factor #72-75, get a card as part of a triptych with X-Factor and Mr. Sinister, meaning they have appeared in exactly as many stories as trading cards. 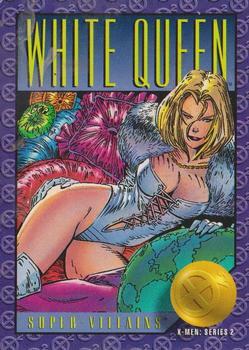 Selene gets her own card (as the Black Queen, despite the Hellfire Club's Inner Circle having been effectively destroyed by the Upstarts), presumably due to her appearance in Uncanny X-Men #301 and tangential relationship to the Upstarts plotline. Jamie Braddock receives his own Super-Villain card, the first place I ever encountered the character (at the time, I had a hard time imagining an adult man whose costume was a diaper as being much of a threat, somewhat souring my opinion of Excalibur - which I wasn't reading - in general). 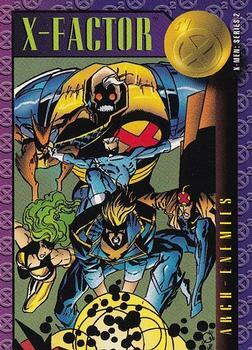 Fenris is featured wearing their Eurotrash attire from X-Men #4-7, but, curiously, neither Maverick nor Omega Red (introduced in the same storyline) receive their own cards despite appearing in Series I (as a point of comparison, Deathbird gets a card in this set, despite not appearing in any X-books recently, most likely getting grandfathered in from series I), though Omega Red does get featured as part of an Arch-Enemy pairing with Wolverine. Phantazia, who beats the Nasty Boys by having appeared in TWO stories at this time, gets her own card, further contributing to my young belief that she was an older, more-established character than she actually was. 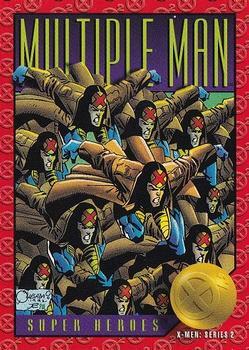 Hazard, however, I was well aware was a one-hit wonder despite earning his own card (which, curiously, is the one character card listed out of alphabetical order; it appears between Shinobi and Sienna Blaze;perhaps he was a late addition to the set, and slotted into someone else's place in the order). Speaking of Sienna Blaze, she also has her own card, despite not yet appearing in a narrative story (she did appear in Stryfe's Strike Files, with one of her images there using the Mark Pacella art from her card in this set). Silver Fox appears in her "she's alive and an agent of Hydra" attire, one of the few characters lifted specifically from Wolverine's solo series to make the set. 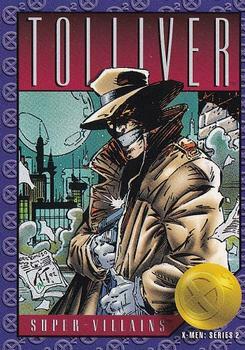 Tolliver's card represents perhaps the most complete image yet presented of the character (who usually appeared in the shadows or off-panel in all his X-Force appearances). Cerise, Kylun, Feron, Widget and Micromax are all listed as members of Excalibur, with Braddock Manor as their base of operations. The Dark Riders, with Stryfe as their leader, receive their own team card, as does Cable's former mercenary group Six Pack, with both Domino and Vanessa listed as members, and without Cable. A relatively iconic look for the character which tones down some of the Liefeldian excess. Similarly, this is one of those iconic images of Gambit (this, or something similar to it, got used in a lot of marketing materials around this time, I think). 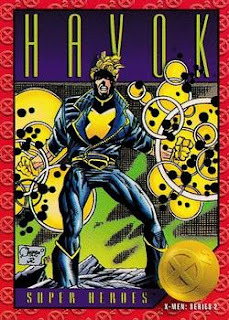 Havok always makes for a fun card because of how his power is depicted; I really like the abundance of circles Quesada uses. As in the previous series, Multiple Man's card has some fun showing off his power. A strong, Art Adams-esque image from Joe Maduereira which captures the essence of the character. The perspective shift changes things up, while still expressing the character's raw power. There are several cards in this set which reach for Jim Lee-style cheesecake; this is one of the few which pulls it off. Not the sharpest line work, but I like how the various characters are staged to form a cohesive whole, and the way the personality of the group is expressed. The first series of Jim Lee-led X-Men cards is a tough act to follow, no matter what, and it would be tough to find any artist(s) for the second series who could match the star power, if not the pin-up-y skill, of Lee (and to this series' credit, turning to the regular artists of the books at the time is a smart move), but this series shoots itself in the foot in several significant ways even beyond Lee's (entirely out of Marvel/Skybox's hands) absence. 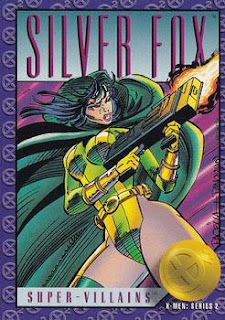 For one, the overall design of the cards is a step down, with the card fronts too busy, leaving the art feeling cramped and less-impactful (a problem shared with the third Marvel Universe series). Secondly, while Lee's absence is understandable and the use of regular series' artists smart, there's nevertheless some really awful art on display in this series, thanks mostly to the presence of Pacella & Panosian (the Pyro card in this series is possibly the worst looking trading card, ever). 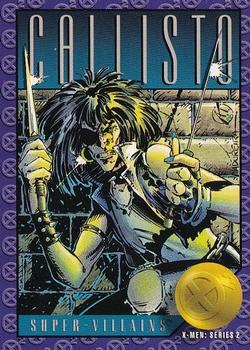 Finally, the decision to write the biographical information from Xavier's perspective isn't inherently terrible, but given the timing of this set, released out while many of the books were still largely independent of each other (X-Force had, just barely, reconciled with the X-Men, but were still largely off doing their own thing, while Excalibur had shared just one adventure with the X-Men at this point) and while the storytelling approach of the day was still "pile mystery on top of mystery", far too many of the cardbacks are forced to start off with some kind of admission from Xavier that he doesn't really know anything about the character in question, but he's heard "__" about them. 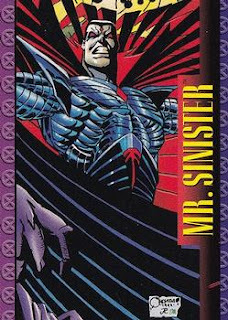 It leaves the impression that Professor X is woefully out of touch about all the people who operate, ostensibly, in his name, and while that's probably true at this point in publication time, it's maybe not the best thing for a trading card series (meant, at least in part, to promote the comic books) to emphasize, no matter how inadvertently. The end result is a set of cards that, arguably moreso than any other, is enjoyable really only as a snapshot of the time its chronicling. There are elements of that to the Jim Lee set, but that series also has, you know, the Lee art to recommend it. The later Fleer Ultra series also certainly have their share of "of their time" elements, but those sets benefit from a higher quality, Masterpieces-esque design. Here, with the cramped, occasionally sub-par, art and poor design decisions, the only thing left to appreciate is how it reminds us of that time Polaris briefly wore a gold metal costume, or how the Nasty Boys once existed. It is, ultimately, a snapshot of the franchise circa the Image Exodus and its immediate aftermath, which is fine. Unfortunately, that's all it really is. I think you can view Storm and Mystique as arch-enemies if you look at the Claremont run. 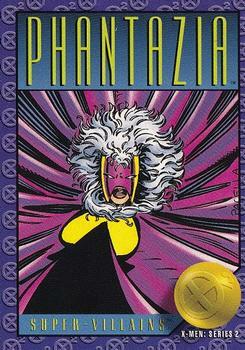 Storm became the X-men's leader in 'Days of Future Past' when Mystique was introduced. Storm became a reluctant mother figure to Rogue, Mystique's daughter. When Mystique joined the government through the Freedom Force, Storm lead the X-men to becoming outlaws. While Storm makes theatrical light shows and boisterous speeches, Mystique just hides and deceives. But viewing Forge as the source of their antagonism... really inflates what I assume were some one-night stands. The elevated antagonism is hard to not see after Claremont's MARVEL FANFARE #40 where Mystique with help of Destiny's foresight sets Storm to be the one who gets blasted by Forge's neutralizer instead of Rogue. 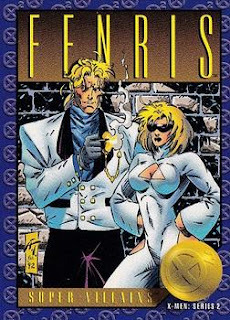 Mystique's relationship to Forge has mainly been a hate-filled one, but in a way she did set him and Storm badly up (but also to meet each other in the first place) with Val Cooper at Forge's very first appearance. I'd say it's the leader vs. leader thing factoring into it more than anything Forge-related: both have the responsibility of leader and struggle to be obeyed and in that way have more in common with each other than with their teammates. It's a slightly Claremontian theme that both as a female get challenged as leader, Storm by Cyclops whenever he's around, and Xavier when he gets his legs back, and Blob had his problems listening to a broad. Plus, boss vs. boss is a natural one-on-one pairing in these circles, as with Cap and Baron Zemo or Mr. Fantastic and Wingless Wizard. Of course after the introduction of Yukio to Storm's life, there's a whole new subtext potential. Elevated Antagonism is my new band name. I don't remember this set as well as the first, though I'm sure I had a ton of these cards. Juggernaut stands out in particular as one I really liked -- though mainly, I seem to recall thinking the Alan Davis cards were the best looking of the bunch, which is odd since in the comics, I was way more into the pseudo-Image style than Davis's more traditional stuff. 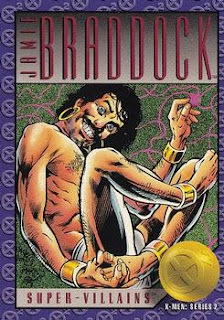 This was my first exposure to Jamie Braddock as well, and I had pretty much the same reaction -- he didn't look like much of a threat, or even like a character I was at all curious to know more about. I Googled Pacella around the time his X-FORCE fill-ins first popped up here, and it does look like he became a better artist with time. It appears he moved into doing storyboards. Search "Mark Pacella art" and you'll find some examples of his more recent stuff mixed in among the older work. I loved this set simply because I remember driving to soccer on a Saturday morning and opening my box of cards an sorting them in the card wishing I had card sleeves for the holograms that were included. I got the Rare Wolverine in my first box. If I remember right, it was like 1 per case. Also Storm, Cable and Magneto got holograms. 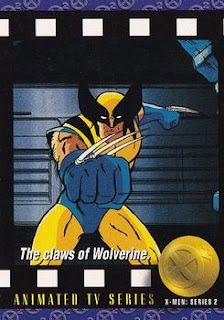 I know that drawing Wolverine’s claws head-on is challenging, but the way they’re set off to the side while his fist is coming straight at us on that Animated Series card is ridiculous. I only aquied a single pack of these, which I will admit with some shame that I shoplifted from a drug store. 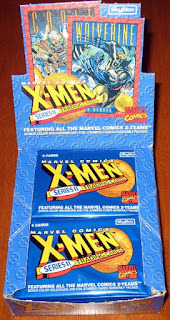 When I opened the pack, lo and behold, there was the Wolvie 3D card. I promptly brought it to my local shop and traded it for some earlier Valant books. The lesson kids: don't steal.